French technology satellite. Multiple European technology test satellites launched on the first Ariane. Research satellite, Germany. Launched 1980. Status: Operational 1980. First Launch: 1980-05-23. Last Launch: 1980-05-23. Number: 5 . Gross mass: 1,080 kg (2,380 lb). 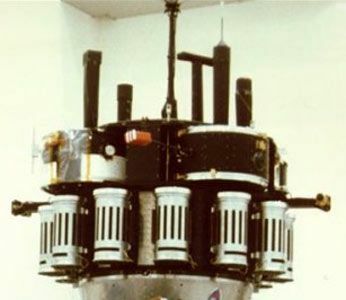 Firewheel Subsats 1, 2, 3, 4 Research satellite, Germany. Launched 1980. Family: Technology, Technology satellite. Country: France. Launch Vehicles: Ariane 1, Ariane. Launch Sites: Kourou, Kourou ELA1. Bibliography: 279, 5, 6500, 12383. 1980 May 23 - . 14:29 GMT - . Launch Site: Kourou. Launch Complex: Kourou ELA1. LV Family: Ariane. Launch Vehicle: Ariane 1. FAILURE: Stage 1 combustion instability.. Failed Stage: 1. Firewheel - . Payload: Feuerrad. Nation: France. Agency: ESA. Class: Technology. Type: Navigation technology satellite. Spacecraft: Firewheel. Decay Date: 1980-05-23 . 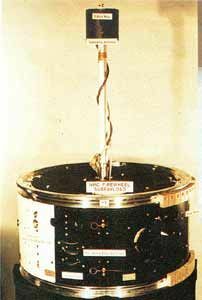 Feuerrad subsatellite 1 - . Payload: Feuerrad. Nation: France. Agency: ESA. Spacecraft: Firewheel. Feuerrad subsatellite 2 - . Payload: Feuerrad. Nation: France. Agency: ESA. Spacecraft: Firewheel. Feuerrad subsatellite 3 - . Payload: Feuerrad. Nation: France. Agency: ESA. Spacecraft: Firewheel. Feuerrad subsatellite 4 - . Payload: Feuerrad. Nation: France. Agency: ESA. Spacecraft: Firewheel.